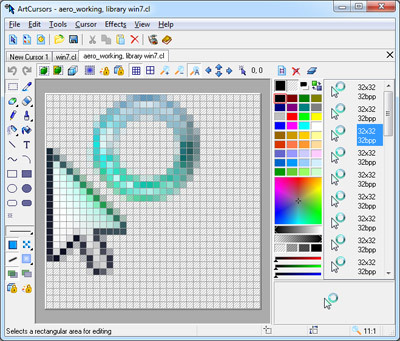 ArtCursors contains all tools you need for creating and editing Windows cursors and managing cursor libraries. The program is friendly enough for the casual user who wants to tweak a couple of standard .CUR files, yet powerful enough for the professional graphic designer who needs to create complex animated cursors and manage large cursor libraries. Using this program you can create and edit static and animated cursors with image formats in either standard or custom sizes, with color depths up to 16 million colors. It supports smooth cursors in 32-bit color depth with 8-bit alpha-channel. Paint tools include: color replacer, color selector, spray can, pencil, brush, flood fill, text tool, line tool, rectangle, curve, ellipse, 3d frame and enhanced gradient and chess fill. You can set cursor hot spots and test cursors. You can import and export .cur, .ani, .ico, .bmp, .gif, .jpg, .jpeg, .png, .psd, .xpm, .xbm, .wbmp files, import .wmf, .emf files, export .rc files, export animated cursors to animated GIF images , capture screen. You can even extract cursors from Windows executables, libraries (including .exe, .scr, .icl, .dll, .il, .nil, .ocx, .vbx, .dpl, .bpl and several other file types). ArtCursors allows you to import, export and change color palettes for cursor images. With ArtCursors, you are can split compound cursor s into simple images and break down entire cursor libraries into individual cursors. You can also create your own cursor libraries. ArtCursors scans files and folders for cursor s, deletes identical cursors from libraries, sorts cursors within libraries, performs drag and drop operations to files from Windows Explorer or other file shells and drags and drops cursors from one library to another. You can move cursors between libraries as well as copy and paste images to other applications. Compatible with Windows 8 and 8.1. Recent Changes: Addded: Inner Shadow effect, Support for 1024x1024 Mac OS icons. Fixed: Small bugs. Try a fresh version of a smart mouse pointer editor! ViVi Cursor is an advanced mouse cursor trail enhanced tool for Windows. OCR-A and OCR-B Fonts in TrueType, OpenType and PCL. MICR CMC7 font is used on bank checks in most Spanish speaking countries. Hi-Visibility Monospaced TrueType fonts for Text Editors. A better font for Console mode and DOS boxes. More clarity and more sizes.